I’m going to be upfront. This will be without a doubt the most difficult, and possibly even painful, review I have ever had to write. Having said that, I am going to throw this out there. It shouldn’t have to be said if anyone reading this has any idea who I am or is the least bit familiar and acquainted with me. Still I am going to say it. 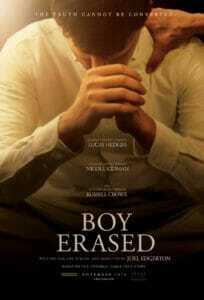 I am gay, and having to watch a movie that deals with the evils of Conversion Therapy was very painful to watch. Boy Erased tells the story of college student Jared Eamons, and some of the problems he faces when someone attempts to “out” him as gay. Why is this bad? Because he lives in a small town in Arkansas, and his father is a Baptist preacher. This story also takes place during a time when Conversion Therapy was your one stop ticket to get that troubled, demon possessed family member “cured” of being gay. That is what Jared must face or risk being cutoff from his family and friends. To go any further would run the risk of me writing a very subjective essay regarding Conversion Therapy, and that is not what I want to do. That’s why this is the hardest review I have ever had to write. Adapted from a book written by Garrard Conley this tells his story of what he had to endure when growing up. Even as the theater lights came on I heard one person talk about the crazed behavior of some of the people in the movie, possibly causing him to have some problem with its believability. Again, this is a true story and Conley himself, and actor/director/screenwriter Joel Edgerton did the adaptation for this movie. The subject is extremely difficult to watch as its purpose is to shine a light on Conversion Therapy, and the experiences depicted are ugly and at times even violent. Even when the man running the facility (Edgerton playing Victor Sykes) resorts to Bible quotations, it is done with the purpose of bashing and making people feel broken. This then leads to the topic of the cast, specifically Lucas Hedges as Jared Eamons, Nicole Kidman as the mother Nancy Eamons, Russell Crowe as the preacher and father Marshall Eamons, and the aforementioned Edgerton as Victor Sykes. This is some of the finest talent I have seen in a drama of this nature. Both Kidman and Crowe are Australian, but they brilliantly caught the perfect nuances that can be found in people who live in a southern state. Their mannerisms, speech patterns and accents were perfectly portrayed here. With Crowe we see the man torn between being a preacher and a father to his son, and then making the difficult choice to choose being a preacher over being a father because of his faith, and Crowe shows what happens as Jared’s “problems” rise to the surface, how the harder he tries as a preacher, the more the situation gets away from him, which in turn causes him to try yet even harder as the preacher. We see him become trapped by his own ideology. It’s not a question of whether or not his faith is correct, rather how he chooses to hide behind it instead of trying to be a loving father to Jared, and by hiding behind it he becomes just as much trapped as Jared is in regards to his own personal dilemma. Then there is Kidman as the mother. A subtle storyline that gets the briefest of addressing is the role that women play in a culture such as this, especially when married to a Baptist preacher. As the movie progresses we see the steadfastness that Nancy supposedly has for her husband start to erode away once she sees her son’s wellbeing is threatened. She too is trapped by convention as a preacher’s wife, but instead of falling back on that role she is expected to play in the same manner that her husband does, she chooses a different path and stands by her son as a loving mother. Kidman’s performance shows the clashing of ideas that Nancy must endure before coming out on the other side in realization about her son. Because of who, what, and where she is, those changes are still very much “restrained,” but they happen nonetheless. The change is there and you can see it in her eyes. Just as Crowe’s character finds himself trapped, Kidman’s character discovers a new sense of liberation. Then there is Edgerton who has the unenviable task of serving as both director and actor in this movie. As a director, Edgerton managed to pull out of these actors some performances that have “Oscar” stamped all over them. As intense as Crowe’s and Kidman’s performances are, they are built on minimalism. 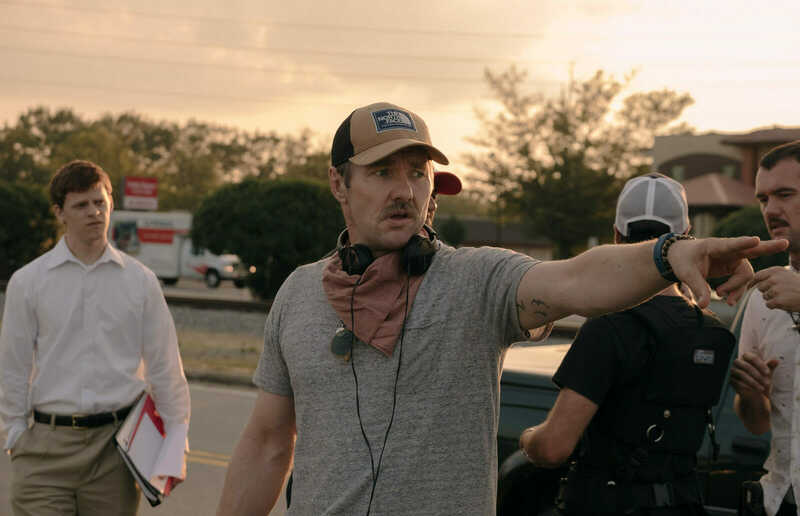 Edgerton was able to keep them wound up tight, but have them still act in a way that would show the tumultuous thoughts and feelings that were underneath the surface in each of them. 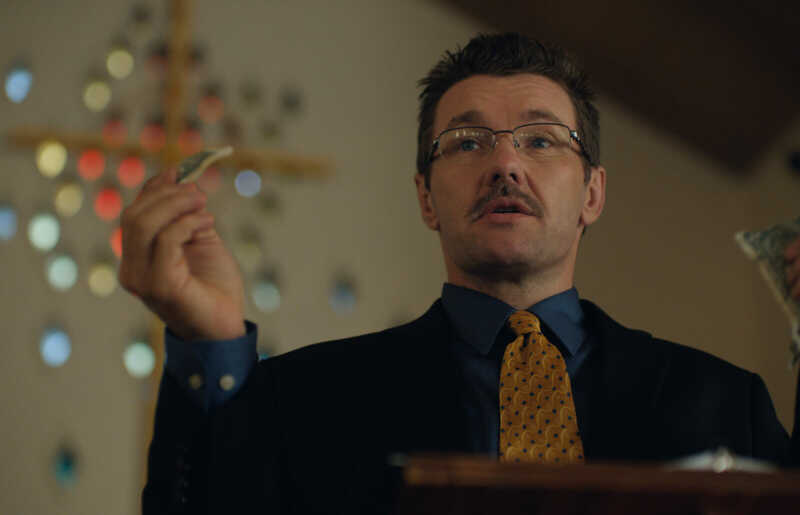 This of course is a far cry from the role that Edgerton plays as Victor Sykes. As wound up and controlled as Crowe and Kidman were with their roles, Edgerton was the complete opposite as the almost crazed over the top Sykes. From the moment we meet him he has that hellfire and brimstone approach, mixed with faux psychological rubbish as he attempts to brainwash, and even bully, some of the residents at this Conversion Therapy Center. It serves as quite the counterpart to Crowe’s performance preacher with the intense inside, but is always calm and collected on the outside. With Sykes it’s all loud, outwardly intense, and at times downright mean, in the way that he deals with the residents there that simply have a desire to not have any gay feelings whatsoever. Instead he relies on some very unorthodox methods to get the desired responses out of his little flock. (l-r.) Lucas Hedges stars as “Jared” and Russell Crowe and Nicole Kidman as his parents “Marshall” and “Nancy” in Joel Edgerton’s BOY ERASED, a Focus Features release. Now I need to address Lucas Hedges as Jared. This character is growing up in a place and during a time where resources for youth who are struggling with their sexuality are not readily available. We see how tortured he’s becoming as he continually represses his feelings and tries to be the person he’s expected to be. The longer we see Jared dealing with the therapy center the stiffer his demeanor becomes. Hedges gives the appearance of almost walking around in a straight jacket at times. Even moments of resistance to what he’s experiencing have its own sense of restraint until a moment arrives where he finally explodes with frustrated rage. And then later when he finally has his moment of confrontation with his father Hedges gives us a completely different Jared. There is something still wound up and restrained in him, but Hedges plays him with his shoulders squared back and with an air of confidence, showing us that Jared is his own man. For anyone to act alongside award winning actors like Kidman and Crowe that individual would most definitely have to bring his or her a-game, and Hedges (an Oscar nominee himself) does that with every scene he’s in. He gives one of the most convincing acting performances I have seen in years. As painful as it was to watch this movie, it was also a delight because of these amazing performances. This is a character driven movie laced with some amazing imagery. After having a moment where Jared, for the first time in the movie, finally proclaims who he is, we then see him get in a car and as he drives away everything about him suddenly starts to change. We see his shoulders go down and actually relax as the slightest of smiles starts to appear on his face. It is his moment of self-actualization as we see Jared finally become healed and whole. Based on the honesty in which this story is told, and the stunning acting performances that were delivered, Boy Erased receives 5 out of 5 stars. This film is produced by Focus Features. Special thanks go out to Fingerpaint Marketing for the press screening opportunity to see Boy Erased.